More traffic light improvements in Doral! The City has been diligently working with the developer, the contractor, and Miami-Dade County to ensure the traffic signal at NW 107 Avenue and NW 60 Street is operational. More traffic light improvements in Doral! 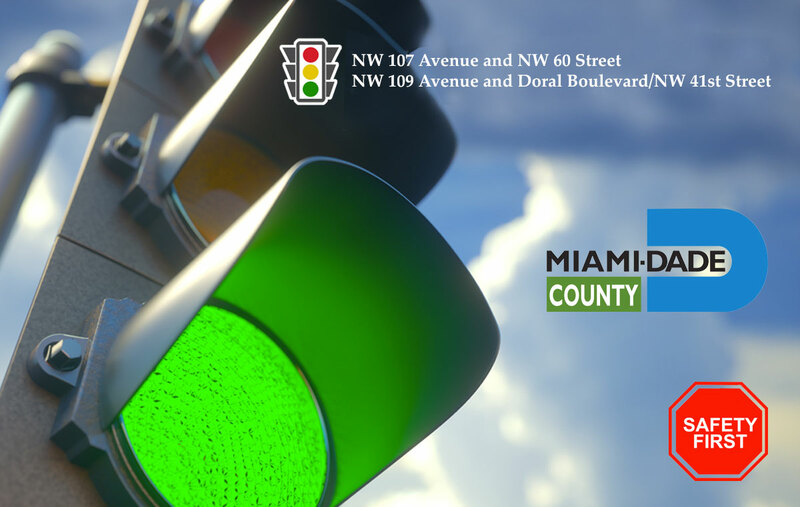 The City has been diligently working with the developer, the contractor, and Miami-Dade County to ensure the traffic signal at NW 107 Avenue and NW 60 Street is operational. We are happy to report that the this traffic signal, a requirement of the Landmark South Development, will be on-line by the end of February 2019. The City will continue efforts to have signal complete as soon as possible. The City is also in works to add a traffic signal on NW 109 Avenue and Doral Boulevard as part of the proposed project at that site. We are currently going through the processes with Miami-Dade County to evaluate and confirm if the proposed traffic signal at this intersection is indeed warranted as build-out of the project advances. Stay tuned for updates on this! Many people may not know that all the traffic signals in Doral are owned and maintained by Miami- Dade County. That is why collaboration is integral in adding these signals to make our streets safer and help alleviate traffic congestion.